“Bren Ahearn: Strategies for Survival” at Bellevue Arts Museum takes a centuries-old folk-art tradition and turns it on its head. When it comes to protesting gun violence in the U.S., what’s the best way to go about it? Voice your frustrations on social media? Contact your congressional representatives? Take to the streets and howl? Or stitch mass-shooting survival advice on a sampler? San Francisco artist Bren Ahearn makes an unlikely case for that last option in his small but potent exhibit at Bellevue Arts Museum. 11 a.m.-6 p.m. Tuesdays-Sundays, 11 a.m.-8 p.m. free first Fridays, through Jan. 15. Bellevue Arts Museum, 510 Bellevue Way N.E., Bellevue; $5-$12 (425-519-0770 or www.bellevuearts.org). “Bren Ahearn: Strategies for Survival” takes a centuries-old folk-art tradition and turns it on its head. In the wake of the Orlando shootings, “Strategies” carries an especially painful sting. Curator Stefano Catalani opens the show with two vintage samplers to establish the heritage Ahearn is drawing on: a customarily female pastime in which homilies and rudimentary instructional fare are neatly sewn on small rectangles of fabric. Then Ahearn takes over. The first thing he does is scale up the work, with some samplers towering more than 7 feet high. The second thing he does is lace them with content that’s wildly incongruous with his medium. 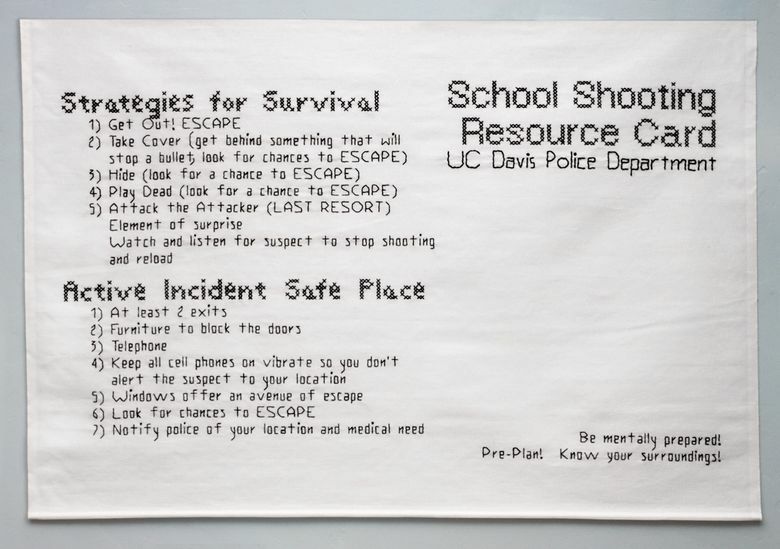 “Active Shooter Directions #4” boils it down to three words in varsity-jacket lettering: “1) RUN, 2) HIDE, 3) FIGHT.” Ahearn’s chosen font, usually associated with college sports and pep rallies, feels grotesquely jaunty — and that’s his point. How did this constant threat of violence weave itself into our places of learning, work and communal gathering? Other samplers in the show reflect more directly on Ahearn’s experiences as a young gay boy picking up on homophobic vibes in the culture around him. He has a winning sense of humor, and some of the messages he stitches into his samplers can be droll. 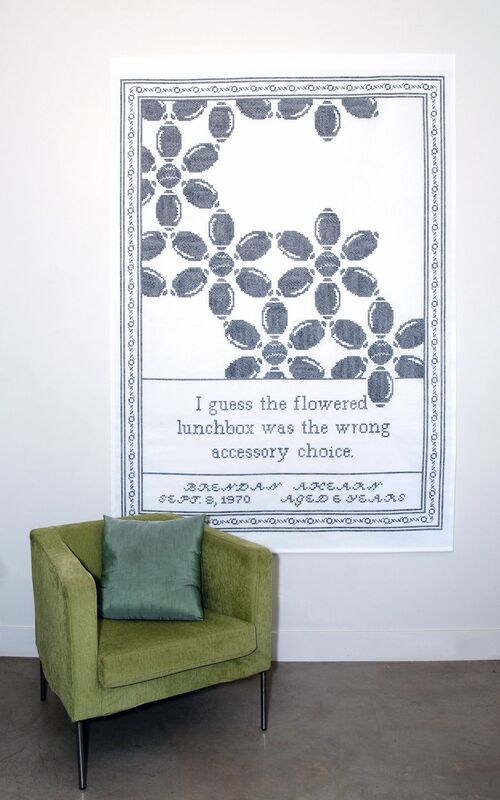 “I guess the flowered lunchbox was the wrong accessory choice,” he writes in “Sampler #9” — where the flower petals are, on closer examination, footballs. That violence, clearly, feels alien to him. Another piece, summing up his day-job history, includes gigs like “Temp. 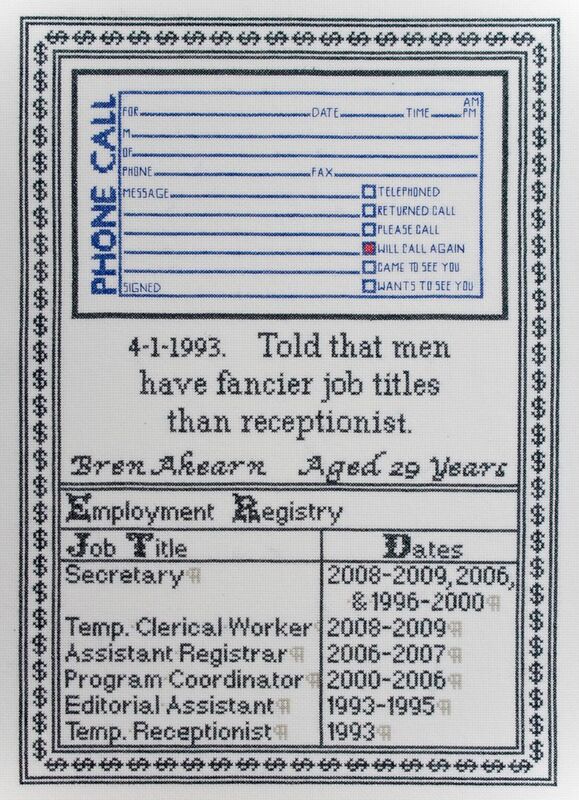 Receptionist,” “Assistant Registrar” and “Program Coordinator.” At its center are the words “Told that men have fancier job titles than receptionist.” That comment, Ahearn said at the press preview, came from an older female relative when he was in his 20s. Deliberate mistakes — misspellings, crammed lettering where not enough space was left — cheerfully figure in Ahearn’s method, inserting a telling flaw in his aspirations toward tidiness. Throughout “Strategies,” surprising candor, vulnerability and irony are in intricate, beguiling play.